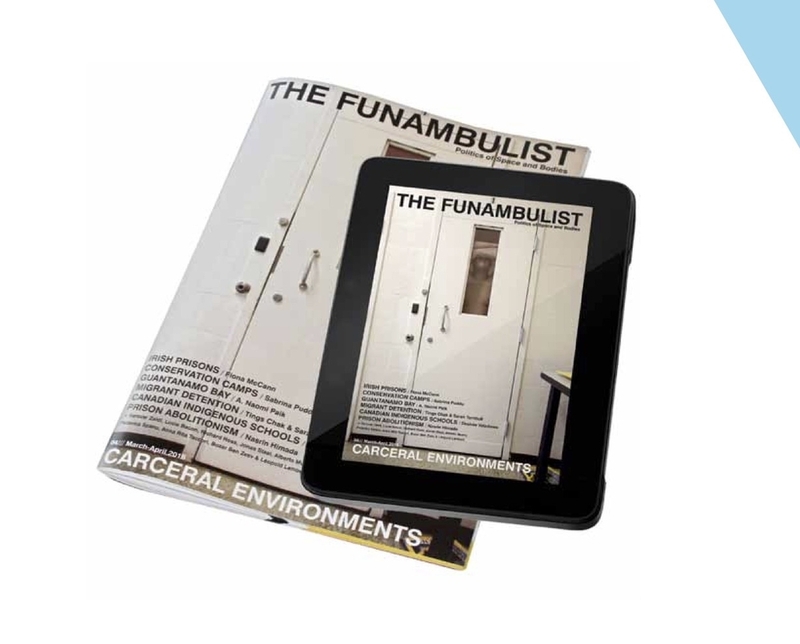 The Funambulist Magazine, through its six annual issues, attempts to examine the politics of design in relation to the bodies. Each issue is dedicated to a particular topic involving a particular scale of de- sign: urbanism, architecture, industrial and fashion design are thus mobilised without any hierarchy be- tween them. The five first issues are respectively dedicated to militarised cities, suburban geographies, clothing politics, carceral environments and design and racism. The magazine operates in complement to two online platforms: a blog and a podcast. These three platforms are dedicated to bridge the disciplines of design and the humanities both through its editorial line and the choice of their contributors. Do not forget to indicate with which issue you would like to begin your annual subscription. Current institutional subscribers include Princeton University, Harvard College, University of California in David and Berkeley, University of Illinois, University of Pennsylvania, Goldsmiths University of London, Architectural Association, and Royal Danish Academy. Léopold Lambert is the founder and editor-in-chief of The Funambulist, a bimestrial printed and digital magazine associated to two open-access online platforms (blog and podcast) that articulate questions about the politics of the built environment in relation to bodies. His research has led him to many different territories, from the borders of the Schengen Space to Palestine, from New York to Mumbai, from Cairo to the Paris suburbs. He is the author of three books: Weaponized Architecture: The Impossibility of Innocence (dpr-barcelona, 2012), Topie Impitoyable: The Corporeal Politics of the Cloth, the Wall, and the Street (punctum books, 2016), and La politique du Bulldozer (B2, 2016).